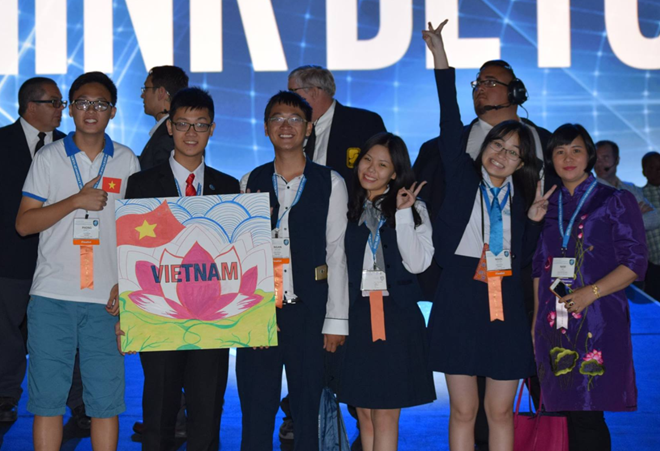 Hanoi (VNA) – Vietnamese students have shined at the Intel International Science and Engineering Fair (Intel ISEF 2016), the world’s largest international pre-college science competition, which took place in the US from May 8-13. Four out of six projects of the team won third prizes at the competition in the areas of chemistry, environmental engineering, mechanical engineering, and cellular and molecular biology. The awarded projects included the “Potential Anticancer Complexes from Platinum and Clove Basil Oil (Ocimum grastissimum L.) by Nguyen Ha My (17), and Nguyen Quang Long (18) from High School for Gifted Students, Hanoi National University of Education. The “Rice Straw Phytolith to enhance CO2 capture: Ideas for sustainable management of rice straw and reduction of greenhouse gases from paddy soils” of Pham Vu Tuan Phong (16), Nguyen Bao Ngoc (16) from the High School for Gifted Students, National University-Hanoi, won in the "Earth and Environmental Sciences” category. The project “Diverse Terrain Wheelchair” of Nguyen Hoang Ngan (18), Pham Thanh Truc (18) from the Le Hong Phong High School for the Gifted, Ho Chi Minh City. Under the "Cellular and Molecular Biology” category, Nguyen Thu Minh Chau (17), Hoang Lu Duc Chinh (16) from the Thang Long High School for the Gifted, Da Lat with their work on “Study on the Ability of Binding and Killing Several Cancer Cell Lines of Antinuclear Antibody” won the third prize. Millions of students worldwide compete each year in local and school-sponsored science fairs; the winners of these events go on to participate in SSP-affiliated regional and state fairs from which the best win the opportunity to attend Intel ISEF.